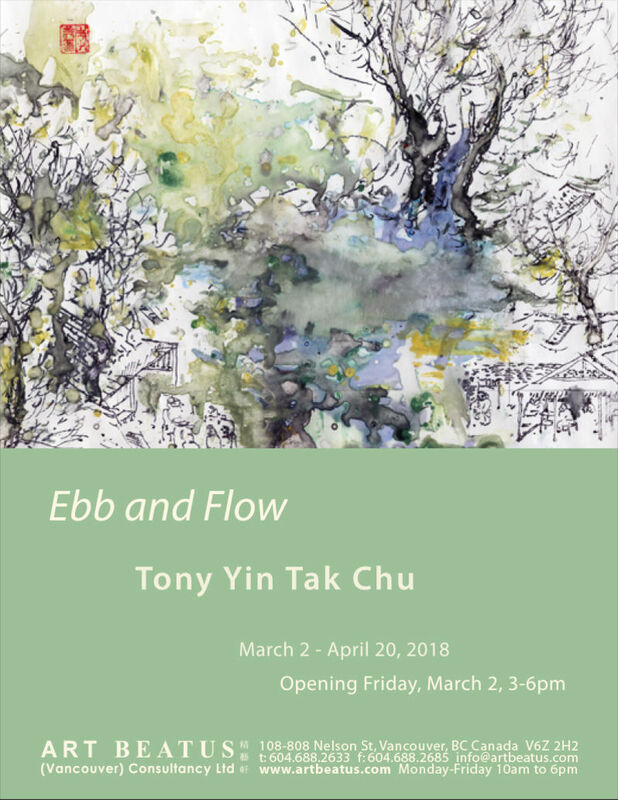 Art Beatus (Vancouver) Consultancy Ltd.
Art Beatus (Vancouver) Consultancy Ltd is very pleased to present Ebb and Flow, an exhibition of mixed media installation of paintings and drawings by local artist, Tony Yin Tak Chu. Originally trained in drawing and painting, Chu worked as a draughtsperson at an architectural and engineering firm in Hong Kong before moving to Canada where, in 2011, he had a public art installation at Lansdowne Mall in Richmond, BC that serendipitously changed the trajectory of his art practice. According to Chu, “Installation art offers different dimensions as the viewers can walk through it, look at the work from different angles, through the spaces and experience the tension within the art pieces.” Since 2014, Chu has been working on an ongoing series of works titled, Liu Shui, based on the Chinese pictographic words 流 水 which translates as flowing water. This series is an installation consisting of a number of scrolls made of mixed media drawings and paintings using ink, drafting pens and water soluble oil pastels on tracing paper instead of more traditional materials such as silk or mulberry paper. Sheer, light and translucent, the drawings and paintings as well as the tracing paper substrate have a diaphanous, delicate quality like water. Simultaneously, the works are textured with mysterious layers that veil and unveil with the rounded folds of the installation resembling the peaks and troughs of water ripples. Through Chu's work, the viewer is presented with the abstract, dynamic and sculptural qualities of “flowing water”. Born in Hong Kong, Tony Yin Tak Chu moved to Canada in 1996. Soon after settling into Vancouver, Chu attended Langara College where he earned a Diploma in Fine Arts in 2004 and then went on to complete a Bachelor of Fine Arts majoring in Visual Arts in 2006 at Emily Carr Institute of Arts and Design. Since his graduation, Chu has had various solo and group exhibitions locally as well as in the United States and Mexico. He has also exhibited his work as public art in Vancouver and Richmond, and in the Toronto and Edmonton transit systems.